"Cask" | "Most Dangerous Game" | "Necklace" | "Gift of the Magi" | "Open Window" | "Very Old Man" | "Sniper"
Below are worksheets that are passed out in class. If you happen to lose one, and you need to replace it, please print out a new worksheet for yourself. Read the story on page 207 of your McDougal Littell The Language of LIterature: Grade 9 book. MP3 -- Click on link to listen to a reading of the story. Story -- click here to read the story. Character Analysis Paper -- Assigment Sheet for paper on "Cask of Amontillado"
Character Analysis Site -- go here to review character analysis. TIQA -- go here to review how to write a literary analysis paper. Edgar Allan Poe -- site has complete texts and a short biography. Aural Library -- site where I got the stream for "Cask" above. This page has MP3s of other Edgar Allan Poe stories. Read the story on page 38 of your McDougal Littell The Language of LIterature: Grade 9 book. "THE MOST DANGEROUS GAME" --Click on link to listen to a performance of the story. The link is to WBEZ NPR's Stories on Stage. Read the story on page 26 of your McDougal Littell The Language of LIterature: Grade 9 book. "Cinderella" -- Read the familiar fairy tale of Cinderella and compare and contrast it to Maupassant's "The Necklace." In what ways are the two stories alike? 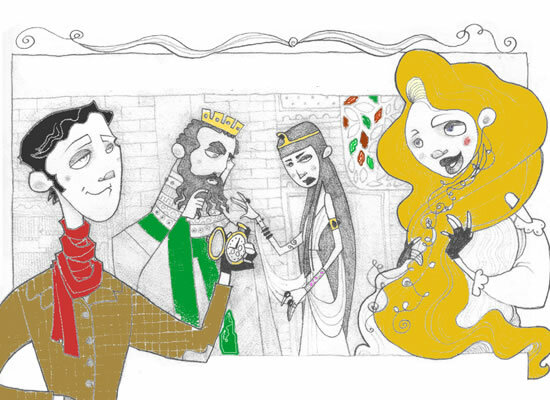 And how does "The Necklace" invert the story of Cinderella? What do both stories have to say about class? godmother -- a godmother in the Disney version, and birds in the Grimm Brothers version, makes it possible for Cinderella to go to the ball; Mme. Forestier makes it possible for Mme. Loisel to go to the ball by lending her the necklace. clothes -- In the Disney version, Cinderella rushes out before her beautiful clothes turn to her shabby clothes. In the Grimm Brothers version, she rushes out to get away from the Prince, presumably so he doesn't come to learn her true identity, which is an impoverished woman. After the ball, she sits in "her old gray frock." 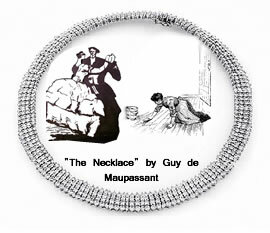 In "The Necklace," Mme. Loisel rushes out of the ball once her husband gave her the "modest garments of everday life whose shabbiness clashed" with her gown. Stairs -- In the Disney version and Grimm Brothers version, Cinderella rushes down a flight of stairs. It is here that Cinderella loses her glass slipper (Disney) or gold slipper (Grimm Brothers). Mme. Loisel also rushes down a flight of stairs to get away from the ball and its guests. Carriage -- In the Disney version, Cinderella's carriage turns into a pumpkin. There is no carriage in the Grimm Brothers version. Mme. 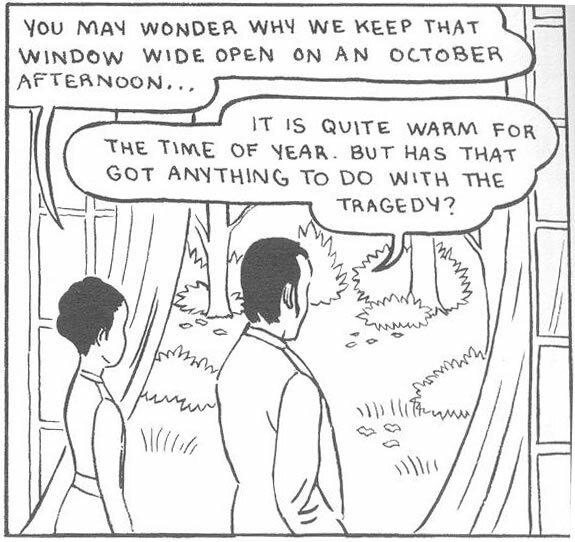 Loisel and her husband take a carriage that is "ashamed to show [its] drabness during daylight hours." Gold/glass slipper -- Cinderella loses her slipper, which eventually, when the Prince sees that it fits Cinderella, brings Cinderella wealth, happiness, and love. Mme. Loisel loses a glass necklace, which she thinks is made of diamonds. This brings about Mme. Loisel's downfall. Class -- Cinderella is the daughter of the "wife of a rich man." Cinderella comes from money; it is her evil stepmother and stepsisters that make her live an impoverished life. Cinderella is eventually made wealthy again. Mme. Loisel was unfortunate to be born "into a family of clerks." Because of a tragic error, her life becomes impoverished. Attitude -- Cinderella is patient with her condition in the beginning of the story. She hides from the Prince when her stepsisters chop off toes and heels to try to fit in the slipper. And for this patience and modesty, Cinderella is rewarded by being returned to her life of wealth and happiness. Mme. Loisel is impatient and possibly even greedy. For this, she is rewarded with worse circumstances than with what she started. Source: The idea of comparison comes from different places, but the guide for "The Necklace" in Gale's Short Stories for Students Vol. 4, Aug. 1998, makes a great connection. Read the story on page 151 of your McDougal Littell The Language of LIterature: Grade 9 book. Setting: Look at this PowerPoint Slideshow of homes. Write about what kind of people inhabit these settings. Story -- Online copy of the story. Audio is from SonicMovies. Check the site for audio of other stories. Queen of Sheba and King Solomon -- Taken from I Kings 10 from the Bible Online. Magi -- Taken from Mathew 2 from the Bible Online. Read the story on page 816 of your McDougal Littell The Language of LIterature: Grade 9 book. Story -- Copy of the story. Read the story on page 863 of your McDougal Littell The Language of LIterature: Grade 9 book. Reading Guide for "The Elephant Man," the nonfiction graphic essay from The Big Book of Freaks by Grahan Wilson. We read the essay in class to think about how people treat people or ideas they don't understand. Garcia Marquez - Critical Views -- a couple essays on "A Very Old Man"
When reading "A Very Old Man," think about what Garcia Marquez is saying about how people would react to the second coming. Would people know that it happened, or would they pass it off as nothing? 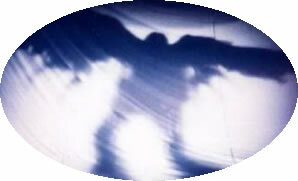 How do the people in the story react when the angel doesn't behave the way they would think an angel would behave? Here are some passages from the Bible that can help you make this analysis. Passages are quoted from Bible Online. Read the story on page 162 of your McDougal Littell The Language of LIterature: Grade 9 book. Story -- Read the story online. Irish Civil War -- Wikipedia. Some good pictures of the street that the sniper is on in "The Sniper." "1921 - 1922: The Irish Free State and Civil War" -- Presented by the BBC. Information to help with the setting of "The Sniper." 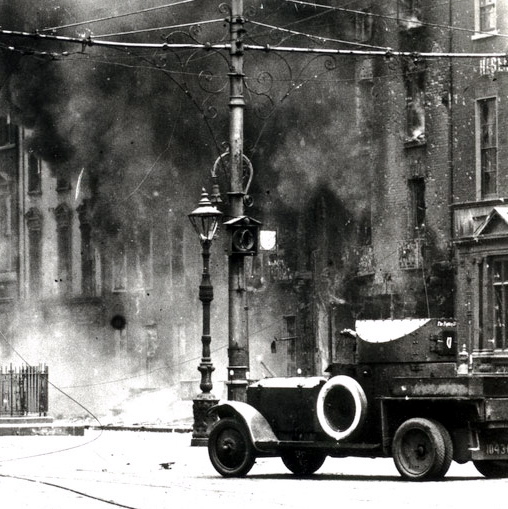 Image of a Free State amored vehicle during the Irish Civil War. Audio -- Click here to listen to this story .